Get market results faster and smarter. Lismore’s Accelerate Workshops are hands-on, intensive, customized sessions designed to have an immediate and lasting impact for you, your team and your business results. 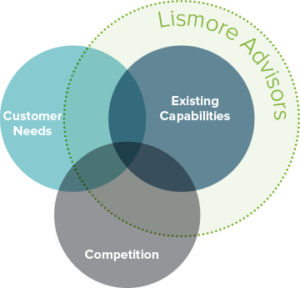 Our unique 1-3 day sessions include intense and disruptive simulations with Lismore Advisors with unique expertise that powerfully prepare participants using critical interactions designed to equip them for immediate market impact. Our seasoned facilitators bring their business acumen and experience from conducting Accelerate workshops around the world with global industry leaders. The outcome – More confidence, Better Preparation, Higher Impact. No one knows the market better than the market itself. Our 400+ diverse Advisor Network spans the world – industries, business practices, operating styles, regulatory environments and cultural structures. You’ll get their outside perspectives and an approach that provides the clarity and focus to make complex market problems a thing of the past. Together, we will equip you with a strategy to overcome roadblocks, recognize potential new opportunities and get you to market in the most targeted way possible.